Jon Bon Jovi sang it well, “Living on a Prayer,” although probably not realizing the beautiful declaration it truly is. Living on a Prayer is exactly where Kristine and I have been finding ourselves over the past two years and especially within the past ten months. I have been cautious about blogging on my own personal finances but have arrived at a place now that I believe what I am about to share can be huge encouragement to many who may find themselves in the same place. In this church starting journey God has us traveling on he has constantly pushed us, encouraged us, and strengthened us. It has, from day one, been the biggest financial stretch God has ever placed us in. We left a city where we had financial security and a long standing job in ministry that was growing and wouldn’t go away and arrived in a city with zero financial security and job that wasn’t. From month to month we watched as many faithful partners helped fund the ministry here in Seattle; as God gave us property and increased our vision for this city; and we watched as last January came and the money disappear and our pay checks cut in half and then vanish all together. The reality of having no paycheck is, the bills continue. So God placed our family in the epicenter of a renewed shocking realization that we are living on his security not financial security. Literally we have gone months without any money coming into the Carpenter family household. The money our partners and tithing Body of believers here at Epic Life is going to continue ministry, starting the church and taking care of bills we are responsible for as a church. But…God is still taking care of us. We are stretched to the point of breaking, but not breaking, because he doesn’t give us more than we can handle and at the same time we literally have no income. Its so crazy. Three years ago I had many people who asked me about the wisdom of leaving Winona, MN and the security that it represented and moving to something like starting a church and the intense insecurity it represents. One person said to me. “What are you going to do when you are in Seattle and you don’t have a church around you to ‘bail’ you out?” And, there were many who said that it just wouldn’t work. Others who tried to stop it all together. Were they right? The fact is…God called us to start a church, a movement, a visionary journey of creative discipleship and reconciliation that will change a city. So in the long run it really doesn’t matter if there is money available to live on or not, we will do what he has called us to do. Period. Please don’t feel sorry for us. Feel sorry for yourself if you have never been taken to brink of disaster and taught to lean on Jesus in greater ways. Sure our family doesn’t have the money to keep up with our bills, we don’t have the money to take a family vacation or set up a retirement and savings program or buy the latest flat screen TV or go to a movie or buy gas for our cars. But we do have Jesus and he tells us not to worry about our clothing and food…He will take care of us. Honestly, I don’t see it yet. I just told a gentleman here in the Green Bean coffee shop that I feel like a cliff jumper and I am falling through the air and my hand is on the rip cord but God is saying, “wait for it,wait for it,” and I am waiting for his signal as the ground approaches at a wild speed. Many of you who read this blog have been God’s answer to prayer. Two of you have sent us huge gifts, taking care of our mortgage. Many of you sacrificially give on a monthly basis allowing God to stretch you. Most of you spend time praying for my family, Epic Life Church and the massive influence God is giving us here on Aurora in North Seattle as we encourage life transformation by finding an epic life in Jesus Christ. I am confident in these points. We are in exactly the right place at the right time in the History of Seattle. God will provide in miraculous ways. He is Faithful! Epic Life Church will continue to grow and thrive on Aurora. God has provided the perfect leadership for Epic Life. Our Faith in Christ is solid. My wife is confidently by my side. Now I believe it is time to write the book about the success of God’s church in Seattle before it is. We are doing more than living on a prayer we are living on a calling. After a four hour night sleep and packing all day and adding another 16 ft. truck we left Winona Monday the 30th at 5 pm, yes two and half hours late, but really what is late. We headed for Worthington, MN to stay the night with Kristine’s dad and family. Most of them were able to come to see us and give us a few parting words. Let’s be honest some of them really aren’t happy about his venture to start a Christ centered fellowship in Seattle, and they expressed it, kindly. But Kristine’s big brother Ken said it beautifully, “You guys are living. You have gotten out of the rut of life that so easily entangles us and you are living.” I needed that Father. We had tough conversations with Kristine’s dad, He felt like I am uprooting my family from something that is good and moving into the scary and uncertain. I respectfully told him that when a plant in his garden gets too big… sometimes to help the plant continue growing it needs to be divided, uprooting one part and replanting it in another place where it can grow and add more beauty to the garden. I think he understood my analogy. In the long run he supports what God is doing and ended the night by giving us his blessing. He is a good man who understands that people are lost and need a Savior. We needed that Father. We left early this morning to jump the South Dakota Gap and try ending up in Montana. With a stop at Chamberlain on the Missouri and then at the Mt Rushmore Heads we headed towards Belle Fourche (pronounced – Bell Foosh), SD to stay at Wyatt’s Hideaway Campground. Pulling into the campground sparsely occupied we met with Ken the owner who pointed us towards three parking lots. The car and van and 16 foot truck with car in tow parked just fine. I took my 26 ft. heavy loaded diesel pulling the Mini Cooper around the turn and into a bit of grass only to sink in about eight inches. Ken came over with his backhoe and pulled me out, leaving trenches in his nice grass. He was frustrated, but cordial. Come to find out the place he wanted me to pull in had his drain field pipes in the ground and we would have done some major damage to them, so God protected us there. For the night we parked in the road. Upon unloading the camping equipment we noticed the six man tent the Carpenter’s were going to sleep in was no where to be found. Hmmm. Probably deep in one of the trucks. Ken came back around with a couple of pales of water to feed a newly planted tree and asked where we were going. I told him Seattle and why and he began letting us know what the church could do better. As a Christian man and observing “Christians” be taught to love others and tell others they love them but falling apart when they do nothing. I chatted with him and we struck up a great conversation, he was genuinely excited about what we are doing. When we began to part ways I asked him if he happened to have an extra tent we could borrow. Nope – instead he took us to his fifth wheel camper that sleeps six extremely comfortably. Thanks Father, we needed that. Dave and Aaron slept in the other tent. Erika and Sam in the back of the van, Casey in the diesel’s bench seat. We are all dry and out of the mosquitoes. That night a storm rolled through dumping inches of rain and striking inside the campgrounds. My tent we would have been sleeping in, had many holes in it, we would have been very wet. I am glad the tent was lost. Father we just ask that you rain down your blessing onto Ken at Wyatt’s Hideaway Campgrounds. Please fill the ground to the max every night every summer and give him a huge number of winter campers. We will be off to Montana on Highway 212 by 7 am. “Father, give us your calming Spirit and help us to see your many blessing. We will miss our friends in Winona; they mean so much to us! The Wineys, Meyers, Dennisens, and Ellefsens, who are our Winona small group, the PVC Staff and so many more who have done so much for us and have been an important part of our ministry for so long. Recently I was helping my oldest son with a bit of Algebra, he’s a 7thgrader so the Algebra is pretty basic, basic enough for me to still remember. We were both getting frustrated because he couldn’t understand how to do the problem and I couldn’t explain it appropriately, or well enough so that he couldunderstand. So I decided to put it all away and begin with the basics. I began to realize that he wasn’t grasping the definition of an equation. He wasn’t comprehending that an equation is a phrase that is equal or is in pure equilibrium, in other words both sides of the equal sign are exactly the same amount. Now they may not look the same, but when worked out they will equal the same number, in mathematics the equality of two quantities. In baking a pile of ingredients will equal a batch of cookies. In coffee a perfect mixture of espresso, steamed milk, white chocolate and rasberries equals a Raspberry Satin Mocha, which is my fave coffee drink. When my son understood this basic equation that I created in a picture on the table with blocks of wood he understood basic Algebra and has been flourishing this semester in that discipline. 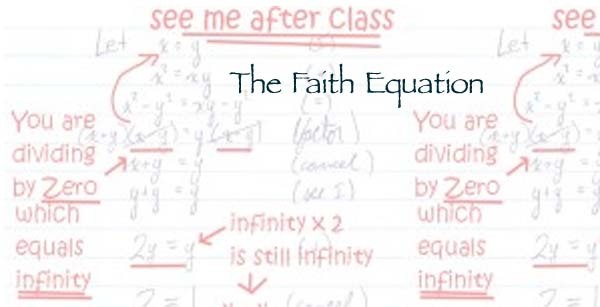 I have recently began to understand something that I am coining the Faith Equation. I have much thought to put into this but currently it is in reference to our fund raising for the Seattle Church Plant but it really applies to much of life and our faith in God. It is going to take a lot of funds to start a church in Seattle, it’s going to take more funds than Kristine and I and our team are capable of coming up with on our own. I suppose if we could take care of the finances on our own it wouldn’t require any faith. It is only in the impossible that that Faith is proved and developed. One question we have is, “Where are we going to get this money?” Another question is, “When is it going to arrive?” Working out both of these questions causes us to realize that we are unable to produce the money on time. It is impossible. So God is at work in us, developing our Faith, stretching us, testing us. We must have a full Faith, not partial Faith. Partial Faith can’t even be a definition of Faith, just as an untested Faith can’t be a true Faith. Because this Church Planting path was initiated by God we will have Faith that he will provide the finances to carry it through to completion. As crazy as it sounds we will move to Seattle even if the money is not in our hands while we are driving out. We have no back up plan. There is no “just in case” contingency plan. God has called us to go, we are going, believing that he will provide the finances. So one side of the Faith Equation is God strengthening our Faith. It takes time to do this and it takes testing. The other side of the equation has to do with those whom God is preparing to partner financially with the Church Plant. He is calling people to sacrificially give to the planting of his church in Seattle. He is asking people to give beyond their means, beyond what they think they can afford. This strengthens their faith. They are being tested in their belief in God that he will take care of them and in fact bless them like his word says he will do. Now, people can give out of their abundance, i.e. give out of what they can afford, what they have budgeted to give, but this requires no faith, it only requires that they stay withtheir budget. The testing of their faith comes in when they commit to give what they can’t necessarilyafford, giving what only God could provide for them to give. It is in this that their Faith is tested and becomes real pure Faith. A Faith that only God could develop and produce. A Faith that takes time and testing. He is faithful. He is also Faithful to develop our Faith, so that we can live lives relying on our King instead of relying on our selves.